I’m not saying that what BevMo is accused of doing was cool—but it’s not the worst thing in the world, either, and the take-home lesson for consumers is not to base their entire buying decision on in-store displays, including shelf talkers. Well, that is undoubtedly true, and I’m sure after all the negative publicity, BevMo is hugely embarrassed and will do their level best to make sure that doesn’t happen again! But, let’s face it, with so many different SKUs on their shelves, and more wines coming in and going out every day, and individual stores probably having to depend on corporate to provide the shelf talkers and other print materials, it’s awfully hard for the floor staff to keep everything current. I’ve seen the same vintage variation in other big box supermarkets, and also seen how not even some wineries can keep up with the current vintage on their own website! So this isn’t to excuse BevMo, it’s just to provide a little context. Besides, do you think that there’s going to be a huge difference between a 2012 Malbec that gets a good score and a 2013? Probably not. The shopper who complained about BevMo told the TV station she felt “swindled a little bit.” That’s an exaggeration. “Swindling” is the conscious act of defrauding somebody: My Webster’s dictionary calls it “to get [something] by false pretenses or fraud.” I don’t think that anybody at BevMo deliberately performed a fraudulent act upon the public. Surely it was, as I said, a simple mistake or oversight by a busy staff that just couldn’t keep up with everything. Look, sometimes I think these class action lawyers have gone amok. As for the TV station, we’ve all seen local television news in our own cities and home towns. We know how desperate some of these “investigative” reporters are to find some scandal, some egregious violation of the public trust, to report on the 5 o’clock evening news. But I think we also know how they can make a mountain out of a molehill. Go to the article in the link I provided and read the snippets of transcripts of the conversation between the CBS producer and the BevMo clerks s/he confronted about the misleading vintage signs. It reads like a Saturday Night Live parody. Yes, BevMo store clerks—like clerks in all big boxes, and quite a few in small stores too—would benefit from additional training, not just in wine but in everything. But do you really expect a cash register clerk to be a wine expert—to understand the legalities of vintage dating? That seems unreasonable to me. I shop at BevMo and have ever since they opened. It’s a fine chain; there’s a nice one here in Oakland and I’ve bought wine and beer there for many years. When you shop at a big box liquor store, you sort of implicitly understand you’re not going to get the same level of professional knowledge as you would in a small fine wine shop. On the other hand, you usually won’t pay as much money, either. And there is a connection! So lay off BevMo, please. It can happen to anyone. Another early harvest. Climate change? It seems like the last two years, 2013-2014, were mind-blowingly early. The 2013 vintage was “Early [with] exceptional quality vintage throughout the state,” said the Wine Institute. And now, here comes 2015, “which is expected to arrive earlier than usual,” according to the Santa Rosa Press-Democrat. That’s what I also heard last week, while walking through Andy Beckstoffer’s Georges III vineyard in Rutherford, where veraison had already started. Of course, all this comes amidst persistent reports of above-average temperatures in California. Just yesterday, it was reported that June was “the warmest ever for California,” as it also was for Nevada, Oregon and Washington. That simply extended this year’s trend: The entire West Coast, plus Nevada, just went through its warmest-ever January-June. And that was for the second year in a row! Last year, 2014, also was the warmest ever recorded up to then in California, Arizona, southern Nevada and parts of southern and coastal Oregon, according to NOAA. You’d think statistics like these would be enough to convince the most die-hard climate-change denier, but there’s just enough anomalistic weather to keep them hoping against hope that their delusions are real. May, 2015, for example, was unusually wet and cool in California (actually, it helpfully slowed down the ripening)—but, even at that, May “was the first cooler-than-average month in well over a year for the state.” So when a climate-change denier, like Sen. Ted Cruz, declares that, “I believe in following evidence and data. On the global warming alarmists, anyone who actually points to the evidence that disproves their apocalyptical claims, they don’t engage in reasoned debate,” he would seem to be on increasingly shaky intellectual footing, and not abiding by his own rules for reasoned debate. However, I’m not here to indulge in pretentious political-scientific jiggery-pokery (thank you, Justice Scalia! ), merely to chat about our freaky weather. And now, here comes El Nino! We’ve heard rumors of its approach for years now—rumors that turned out not to be true. But for the last two weeks or so, the media increasingly has been rife with reports, such as this one, of “strong El Nino rainfall” this coming winter. Just yesterday, AccuWeather reported that it “could be one of the strongest in 50 years,” with all that that implies, especially powerful rains. 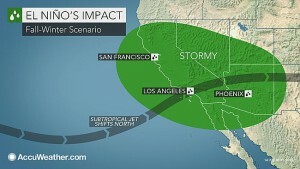 In big El Nino years, California is drenched, wih L.A. sometimes having even more rain than NoCal. I vividly recall the January, 1995 storms, which brought “disastrous rainstorms throughout California,” said the USGS; poor Guerneville in particular, in the Russian River Valley, was hit hard, with people having to be airlifted off their roofs. We want El Nino’s rain, but we certainly don’t want the natural catastrophes. The problem is, usually the two can’t be separated. Fortunately, a lot of the river dwellers in Guerneville, bless them, put their houses up on stilts after 1995. It’s one thing to write or talk about how consistent the Santa Maria climate is. We all know about how the fog blows in in the evening and then melts away the following morning, giving way to turquoise skies. All this is true, but to be here, as I am now and have visited frequently for the last 25 years, is to appreciate it anew. For an eastern-born boy, where the weather changes every 15 minutes, such invariability of the annual pattern is mind-blowing. Each year has two seasons, wet and dry; each day has two times, foggy and sunny. So it was when the mastodons roamed these parts, and so it is today. Yesterday, Thursday morning, I awoke at 6 a.m. to an impenetrable ground fog. When I walked Gus I needed my hoodie. Even when the surface fog blew off at 8 a.m., the high clouds remained throughout the morning. By 1 p.m., when I met Jonathan Nagy, Byron’s winemaker, for lunch in Los Alamos, the sky was cerulean blue, clear, infinite. The sun was strong and hot on the skin. Yet the day remained cool, never getting out of the 70s. Stand in the sun, out of the wind, and it’s hot. Move a corner into the shade and the breeze, and it’s cold. This is indeed the “refrigerated sunshine” that Hawk Wakawaka, I think it was, so aptly described. The vines, like us, to it are sensitive. 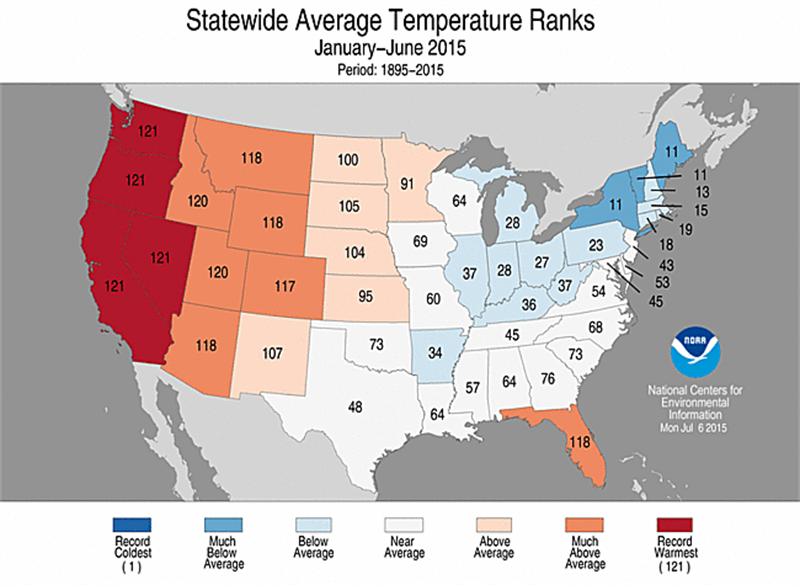 Like the rest of coastal California, the Santa Maria Valley had a dry, record warm winter. Then May came. I think, in the annals of California vintages, May of 2015 will have some renown, recounted by aging geezers around bars. It set records for chill and damp, just at a time when the plants thought it was all right to blossom. Budbreak had occurred early; May’s moisture posed the risk of widespread botrytis. Growers turned a hopeful eye towards June. This month, so far, has extended the pattern for weirdness. The rainfall of last Tuesday and Wednesday was epic, by mid-June standards. Thursday, when I wrote this, finally was warm (not hot), dry and breezy, ideal weather for blowing away water in the vines. But it’s still to early to assess whatever damage this bizarre June storm caused. Although I’m here in the Central Coast and not in close touch with the media, my understanding is that Wednesday’s rain in the North Coast set all kinds of records. In Oakland, it rained for the better part of a day, not heavily, but consistently. I can’t recall anything like that in June in the 36 years I’ve lived in the Bay Area. Viticulturalists—the folks who keep the vineyards healthy—are watching the skies. This has been an unsettling period for them. They know well that this is farming, and that farming never has absolutes when it comes to the weather. But even absent absolutes, they’ve come to expect at least some sort of pattern. But the pattern, alas, seems to be shattering before their very eyes. It may well have been warmer in January than in May. It may well have been wetter in June than in February. Unless you understand our climate, you cannot appreciate how insane these realities are. As I reread what I wrote, I realize I’ve made it sound like all vintages are the same down here in the Santa Maria Valley. I do think that vintage variation here tends to be less than in more northern regions, like Carneros or Anderson Valley. Still, it exists, especially with wines like Pinot Noir and Chardonnay, low-tannin varieties than transmit the terroir into the wines with high-tension precision. The problem in Santa Maria Valley is a cold year, like 2011. I’m hearing increasing comparisons between 2011 and 2015 from winemakers and growers, but I think it’s way too early to go there yet. July and August could continue this cool pattern; equally, they could be hot. Nobody has the slightest idea. Our most expert meteorologists are puzzled. Even with these increased predictions of a strong El Nino in 2015-2016, no one is willing to say what it means. More rain? Average rain? 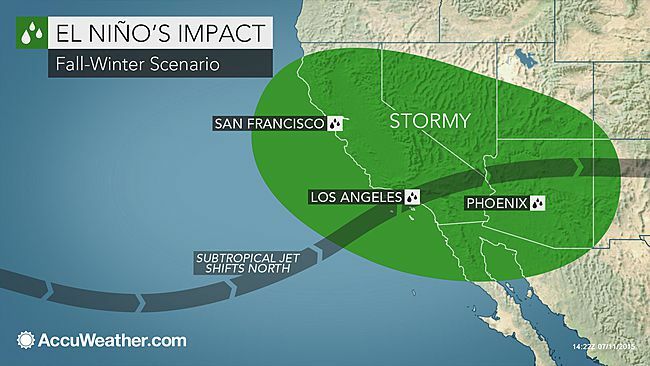 Will Southern California get more rain than Northern California? Will the drought continue, or won’t it? You’d be hard-pressed to find a weatherman who will say anything remotely specific about any of this. The only good news is that this recent rainfall has reduced the early danger of catastrophic wildfires. A blessing. I’m calling this post the vagaries of vintages because you never know what the weather is going to be during the growing season. Farmers have known this forever, of course, ever since our farmer ancestors began harvesting crops, which is one of the things that made us human and led to civilization. European grapegrowers have known it, too, for thousands of years, but here in California, we’re still learning that not every vintage is the same, as was long thought. Granted, our annual variations are far less extreme than they are in, say, Burgundy, but they’re extreme enough, in their own way, and with what appears to be the effects of climate change, they’re becoming ever more bizarre. For example, this past winter of 2014-2015 was exceptionally warm and dry. During January and February we had temperatures in the 70s, even the 80s. As a result, budbreak was early in wine country, and it looked like it would be another record early harvest. Then came May. Wham, a persistent trough parked itself over the eastern Pacific, and for the last three weeks, we’ve had fog, drizzle, rain, below average temperatures and a generally gloomy blah to the atmosphere all along the California coast. Everyone’s talking about it. The grapevines are feeling it. What this dreary weather does, of course, is to slow down the ripening process, which is good in a way, because you don’t want the grapes ripening too quickly, but is bad, because the longer those grapes hang on the vine, the higher the possibility that Autumn rains will strike before the fruit is gathered. We haven’t had a bad rain harvest for a long time—1998 comes to mind—but it’s always a worry. What this May reminds me of is 2011. That was the year that summer never came to California, and it was, of course, an unsuccessful vintage, in some cases disastrous, although I wouldn’t want to paint the entire vintage with an overly-broad brush. It was a year that botrytis hit many coastal grapes, and I don’t think vintners would like a repeat. It’s only May 26, of course, way to early to predict anything, which gets us back to the vagaries of vintages. The seven-day forecast calls for some modest warming up, but nothing radical, and I see that near the end of the coming week, temperatures are set to fall back. That means virtually no sunshine along the coast, only occasional afternoon sunshine here along the Bay, and cool temperatures in wine country. But even winemakers who have followed vintages for many decades have no idea what’s to come. Regarding California’s historic drought, May rainfall has certainly helped, although it’s been under-reported in the media, and apparently a strong El Nino, which brings bigtime rainfall to California, is in the works for this coming winter, although we’ve heard those predictions before, and they failed to come true. If you’re a grapegrower, all you can do, really, is to cross your fingers and hope for the best. Which is funny, because, for all our modern sophistication, farmers today are basically in the same place they were thousands of years ago. P.S. I want to apologize to my readers who tried to comment during the past week and found that the capcha! code wasn’t working coherently. Thank you to those who contacted me through Facebook or email; if it weren’t for you, I wouldn’t have known there was a problem. We think we’ve corrected it now. I hate it when weird computer stuff happens that’s beyond my control, but that’s how it is when we assign our fates to these machines—or to the weather, as do our farmer friends. With the first (light) rain of the season expected tomorrow (today, as you read this) north of the Golden Gate Bridge, I thought it was a good time to consider the 2014 vintage in California. So, as usual, I asked my loyal Facebook friends, who responded in force. The story is this: short, compressed harvest. Record early, in many cases a month before normal. (This means that Autumn rains should not be a problem. If they actually come, which everyone is hoping they will.) A good crop, tonnage-wise, not a record, but then, it comes on the heels of two record-setting years (2012, 2013). Quality? Overall, pretty good. The wines should be plump and approachable. Several people commented on soft acids, but that can be corrected in the winery. On the other hand, others remarked about high acidity, which also can be corrected, partially, through the malolactic fermentation. The exceptional drought has resulted in small berries but that should make for intense flavors. Potential problems? Smoke taint tops the list. The Sierra Foothills have been hit heavy by wildfires. So has the extreme North Coast, but that smoke drifts down to the south. A second potential issue is that the warmth, combined with the drought, has resulted in fairly high sugars, especially in reds, but true phenolic ripeness lags a bit behind. I wouldn’t call this a statewide problem but it could result in some structural and balance problems. In a few cases, the crush rush could be a challenge for vintners running out of cellar space. Several respondents commented on the inverted order of picking, with Cabernet coming in earlier than Pinot and some of the whites, a situation that has vintners scratching their heads, and which may be due to the drought. Overall, the mood among vintners is positive. I’d call 2014 the third year in a row where there’s more cause to celebrate. I must say I find this story disturbing. In brief, the State of California has fined a local winery for using volunteers. Seems the winery didn’t pay them wages, or worker’s comp, so Sacramento has cracked down with a fine so heavy, it looks like it will put this little family winery, in business since 1986, out of business. The story was so preposterous, I called the winery to see if it’s true. I spoke with Westover Winery’s owner, Bill Smyth, who confirmed it. “The State is out of control,” he told me. What will happen now? “We’ll go out of business, 900 of our club members and thousands of customers will lose, and wineries all over California will be devastated.” Bill contacted his state assemblyman, who’s calling for hearings to “do something,” Bill says. But what exactly can be done isn’t clear. What were the volunteers doing? “The same things as they do at all other wineries: work behind the bar, making wine,” Bill says. They’re friends of the winery who loved participating. I’ve volunteered at wineries. I’ve punched down, cleaned tanks and worked in the vineyard, and enjoyed and learned from it. There’s something seriously wrong with this development. I hope things work out for Bill Smyth, and I hope that the California Legislature changes the law to allow volunteers to work at wineries. And how about Wine Institute? Guys, it’s time for you to use your clout in the State Capitol.